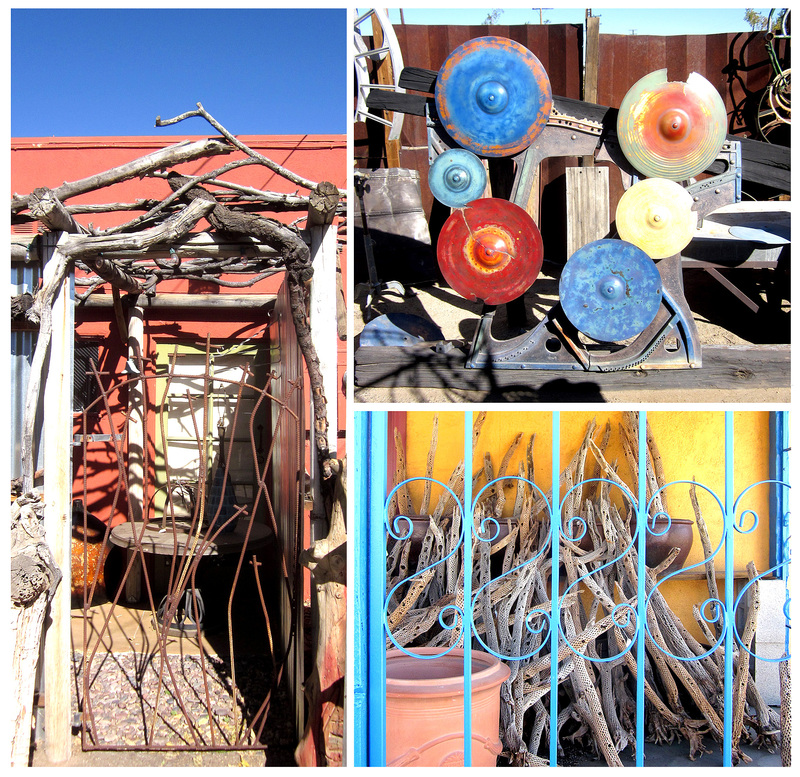 Checking out local shopping opportunities is always part of any Rancho day trip … our visit to Joshua Tree no exception. However, we don’t wait until our arrival before stopping to check out some comely wares; in fact, the first two shops in this post are located in Morongo Valley and Yucca Valley respectively. We’re not in any hurry and both places are on the way, so why not? … let’s do some shopping! CACTUS MART, in Morongo Valley, offers shoppers the unusual opportunity to dig their own cactus … not really a draw in my book, I can dig pricklers at home, but I have to see what-all they have. And, they have a lot! Succulents and cacti, in sizes from tiny to towering are laid out in rows, sometimes under canopies, and are well-and-fairly priced. We buy an unusual agave, a gypsophila, with lovely wavy leaves … Their plant offerings are terrific and plentiful but it’s the non-plant goods that make this a must-stop shop for me. Cactus Mart has a huge assortment of garden ornaments, art objects and other decorative items for sale both outside and inside their art gallery and shop. Almost all medias are represented including metal, concrete, stained glass, ceramic; and there are also framed pieces by local artists. The emphasis is on color and texture, with a definite ethnic and southwestern vibe. It’s an inviting and fun shopping experience with seating areas outside for decision-making and friendly chickens roaming loose. With its cheerful, hard-to-miss sign, and gigantic wire lizard sculptures on its roof, Cactus Mart is a worthy first stop on the road to Joshua Tree. Cactus Mart is located at 49889 29 Palms Highway (Highway 62), Morongo Valley CA, 92256. Phone: 760.363.6076. Website here. 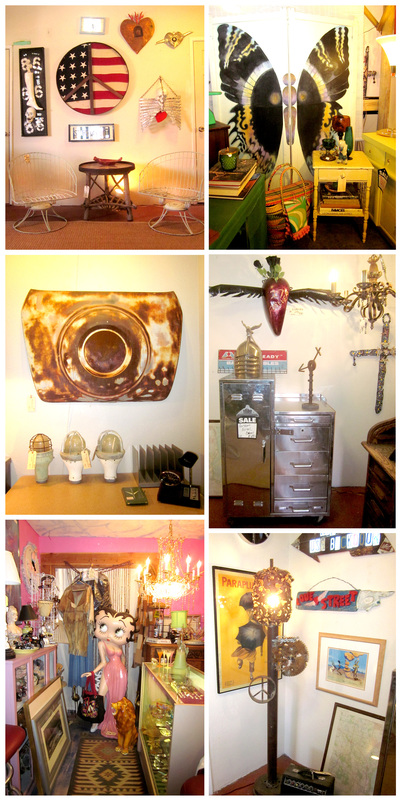 … where we find room after room of crazy, mixed-up, vintage fun! Rt. 62 is one of those groovy antique malls where Granny takes an acid trip and there’s something for anyone with an interest in decorating, whatever period. I particularly appreciate the industrial and found-object pieces, metal furniture, target practice lamps, and local-made objéts d’art. Rt. 62 is not just an antique mall; its compound encompasses a performance space, art gallery and hosts estate sales and other special events. Route 62 Vintage Marketplace is located at 55635 29 Palms Highway, Yucca Valley, CA 92284. Phone: 760-365-4330. Website here. More, in the form of a self-contained outdoor gallery space. Walls like the sides of metal shipping containers enclose an array of pieces by Mazzo using his signature style; many pieces are very large, all of them are metal and all had former lives as parts of machines, cars or signs. Mazzo’s work involves creating a complex multi-hued patina on these metal pieces through the use of layers of paint, then sanding the layers so that the various colors show through and interact, and in the end, waxing them to a candy-coated and shiny finish. We loved the scale of the various pieces and their technicolor dream coats … they reminded me of sugar candies, wrecked cars, iridescent beetle carapaces and the spots I see inside my eyelids when I’ve looked at the desert sun through the car’s window. I wanted one. Seeing the prices, though, we thought it best to walk away … Tanned and silver-haired, I spoke with Mazzo a bit, great guy. After explaining that we were visiting for the day, he strongly urged a visit to the Noah Purafoy installation. Great suggestion as you’ll see later. Bargain Alley is now called Joshua Tree Trading Post; they have works by Lenny as well. There are numerous other shopping opportunities along Route 62/29 Palms Highway on the way to, and in Joshua Tree … but don’t go alone. You’ll need a wingman to ride shotgun and call out “Stop!” at the sight of some interesting bit of retro, antique or western junk. Trust me, shopping like this is way more fun that just looking it all up on the internet first. I would love to get a metal sign in the shape of an old truck for my auto body shop. He’s got a couple, you should check them out. Well, now I have to get Tom to take me up on a road trip. Don’t think it’ll take to much once he sees these pics. Hey, Vickie, you and Tom should make the trip, you’ll enjoy it! The easel sounds interesting… could you email a pic? My personal email is reubix@earthlink.net … If I like it I’ll come by this weekend. Thanks for the tip! I would gladly send a pic but I have this slight techno lack that will keep me from doing this….Sorry!!!! ‘Kay, we’ll stop by this weekend and, of course, call for a best time between errands. Thanks, Vickie! I love that stainless steel locker/chest of drawers thingy. So beautiful. I guess I need to take a trip soon. I guess we’ll have to fight for it! Choose your weapon! One of those bats, or the whole herd of them (or whatever you call a group of them–colony, I guess) would be terrific. I love to watch the bats swoop over my back yard in the evenings. 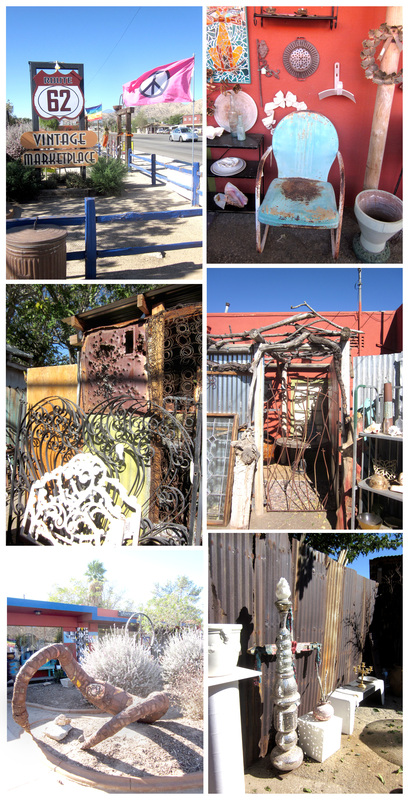 Bargain Alley is now called Joshua Tree Trading Post, and they have some of my work there. Thanks, Lenny and thanks for the java! I’ve added this to the copy in the post.